The Sugarlands Visitor Center near Gatlinburg, Tennessee will be hosting its 34th Annual Festival of Christmas Past celebration. Scheduled for December 12, 2009, from 9am-4pm, this event celebrates Christmas and the traditions that surrounded a Smoky Mountain Christmas in days of yore. Those traditions included gathering in churches, homes, and schools, and many celebrated the holidays through music, storytelling and crafts. This year’s festival will include mountain music, harp singing and demonstrations of basketmaking, quiltmaking, spinning and apple butter making. This event is free to the public. Employees and alumni of Great Smoky Mountains National Park and its partners express the deep connections that inspire their daily efforts to protect, preserve and support the Great Smoky Montains National Park. Visitors also offer special sentiments of what the Smokies mean to them. The Great Smoky Mountains Association has launched a series of podcasts and blogs that are available from their website or the iTunes podcast directory. 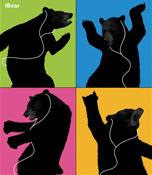 The podcasts vary in subject matter, including audio tours of Newfound Gap Road and tips on what to do when you encounter a bear in the backwoods. In all, they have 41 podcast episodes available and seem to be adding new episodes frequently. Visit the GSMA website to download individual podcast episodes. If you are an iTunes user, you can subscribe to the GSMA Podcast to receive updates automatically and easily sync them to your iPod. On Saturday, May 9, Dolly returns to Dollywood for the premiere of the park’s new musical Sha-Kon-O-Hey! Dolly wrote all eight songs featured in this musical journey that takes audiences to the heart of the Smoky Mountains. As part of her official ambassadorship for the 75th anniversary of Great Smoky Mountains National Park, Dolly will be the musical host in a special 7 p.m. ticketed performance of Sha-Kon-O-Hey! in DP’s Celebrity Theatre. This special ticketed event is a fundraiser for Friends of the Smokies, a not-for-profit organization devoted to preserving and protecting the Great Smoky Mountains National Park by raising funds and public awareness. For ticket information, visit www.friendsofthesmokies.org . Come Celebrate The Great Smokies 75th Anniversary! Great Smoky Mountains National Park Superintendent Dale Ditmanson has worked closely with his partners, Great Smoky Mountains Association and the Friends of the Smokies, and with our neighboring communities, to develop the GSMN 75th Anniversary site as their “Virtual Visitor Center” to showcase “all things 75th”. On their site you will find a rich and evolving variety of information on the Park’s history, current issues, and future visions. Throughout 2008 and 2009 you’ll find information about a wide array of activities and events in the Park as well as officially recognized events in all the neighboring communities. You can even share YOUR photos and stories of your Great Smoky Mountains National Park adventures through the decades! Send your friends and family a cyber invitation to enjoy your approved image. After looking at your adventure, they can upload their photo and story to become a part of the Smokies Family Album, too! Images should contain people and a recognizable feature, overlook, or sign that ties the image to Great Smoky Mountains National Park. Click here for the Great Smoky Mountains National Park 75th Anniversary Site!